• Branch of Service, Company, Regiment and Division. While these two documents were useful, I wanted to try and learn more, and placed a request for Irv’s military service record. The service record request signaled challenges ahead: the 1973 fire at the National Personnel Records Center in St. Louis destroyed approximately 16-18 million Official Military Personnel Files, and 80 percent of Army records for personnel discharged between 1912 -1960. I was not surprised when I received a letter explaining that there were no records available for Irv, other than his final payment document. Something is always better than nothing! The final payment roll confirmed the company, regiment and division. Or so I thought. 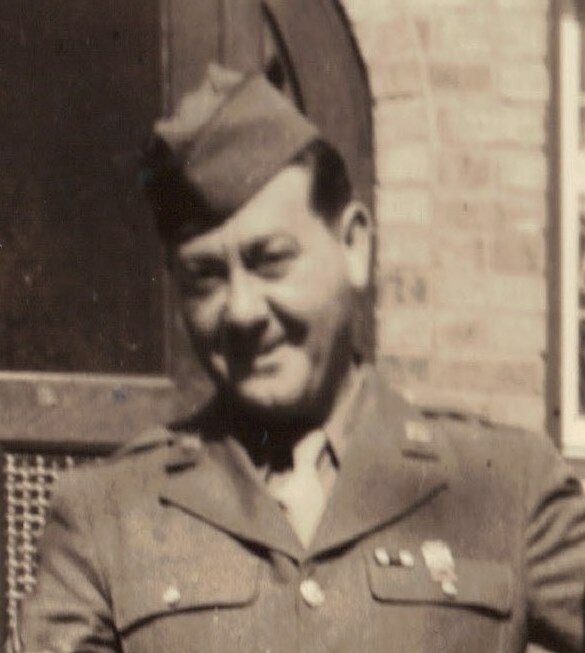 I started to put together a report on Irv’s war experience based on the headstone application and final payment document, both of which placed him in “Headquarters Battery, 8th Infantry Division Artillery.” The 8th Infantry’s members wore a shoulder patch featuring an upward pointing gold arrow piercing a silver figure “8,” all on a blue shield. I looked at dates, maps and locations, plotting where Irv might have gone or seen action. But then I received a box of photos from a relative. In that box were photos Irv had taken while in training and then in the European Theatre of Operations. A few images had information written on the back, some had identifiable landmarks, and others showed enough of Irv’s shoulder patch that the questions started. If Irv was a member of the 8th Infantry Division, what was he doing wearing a patch for the 89th Infantry Division? The 89th Infantry Division patch is a distinct, stylized “W” inside a circle, black on khaki, nothing like the gold arrow of the 8th. There was no mixing up the two. Was he really a member of the 89th? If so, it would explain a few things: photos of Irv training in Colorado (the 89th trained at Camp Carson, Colorado), and some of the locations the 89th fought in Germany matched place names on the photos. Why did the US military have the “wrong” information for the final payment roll and the headstone application? 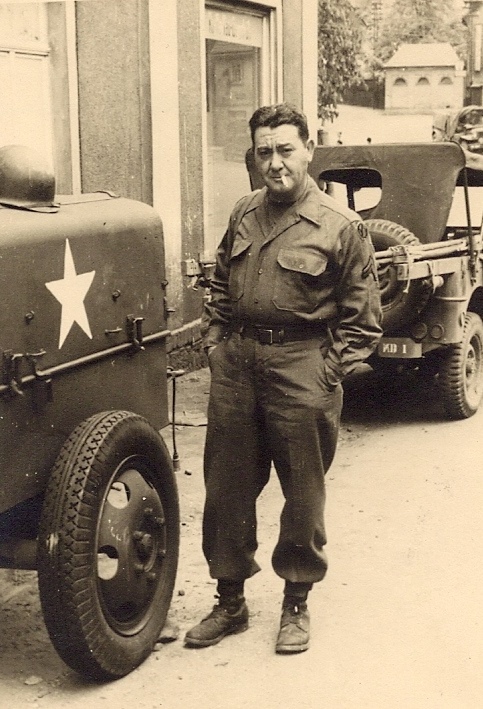 Actually, the information obtained in the two documents was accurate because at the end of World War II, Irv was briefly part of the 8th Infantry Division. Here’s why: when the war was over, the U.S. military in Europe needed to relocate more than 3 million service members, and get them back to a separation center close to the soldier’s final destination. It was a giant logistics puzzle. Attaching Irv to the 8th Infantry Division got him to Fort Leonard Wood, Missouri, a separation center about 130 miles southwest of St. Louis, Missouri. Without the photos of Irv, and examining the shoulder patch, I would have identified his WWII service incorrectly. But at the same time, I would have been working with the documents and the evidence available to me. When researching the veteran in your family, beware the unknown unknowns. On this Veteran’s Day, I’m doubling down on my effort to identify any of the people in the photos my great-uncle took, as well as share the photos in the collection of the Signal Corps at the National Archives. Follow this link and take a look. There are more photos from the National Archives to scan and add to the collection, and the next step for the family photos is to geo-locate them. I also need to start digging through World War II Operations Reports to see if I can determine the company and regiment to which Irv was attached. Much more research ahead!